The mature fruit of all mysticism. The Hidden Avatar – Part Two – What Did He Come To teach? Lord Krishna said “I am equal to all living beings and am neither inimical nor partial to anyone. But as those who approach Me with bhakti are attached to Me, so too I am bound by affection for them.” Source Bhagavad Gita 9.29. Killing animals and eating them, among many other activities, which harm any living entity in any way, is one of the worst things a person can do to create negative karma for himself. Our present karmic reactions, happiness and distress, all have their origin in our present or past life’s positive or negative, kind or unkind activities. Therefore a sane person should always consider this deeply before acting, and with great determination and for his own benefit, remove himself from negative activity. Even if the whole world objects and is against it, one should reject all that is even remotely associated with causing harm to life. The jiva, the real self, does not become one with God, or indeed anything, even after he has attained complete Liberation. The soul retains his individuality under any circumstance. After death or here in this World or hovering on the ghostly plane, existing in heaven or in the transcendental World. There is no situation anywhere, in which the soul can be destroyed or loose his eternal individuality, to think it can, is an illusion. The spirit souls attached to material life, cannot easily comprehend spiritual attachment, nor can they have any experience of it. In reality, it is the souls true function and eternal nature. However, we have become engrossed in attachment to matter which causes us to forget, that we are actually a spiritual particle of consciousness. This is a miserable condition, although hardly any of the Souls who are thus entangled in birth old age disease and death, think so. 5000 years ago, Lord Krishna spoke about the meaning of life, the subtle workings of creation, and the understanding of a self- realized soul. He spoke of the science of yoga in all its forms, the path of work, the path of knowledge, the path of mysticism, the path of devotion. And at last Lord Krishna revealed Himself before Arjuna as the source of everything, His eternal form as the Supreme Lord. Dr. Daniel Coleman, associate editor of Psychology Today and author of The Varieties of Meditative Experiences. In a vada discussion the motive of all concerned is to find out the truth. This is the ideal kind of discussion. It is for persons who are sober and impartial about the outcome; they simply want to know what is the truth of the matter. They are in the mode of goodness. PraJalpa is a discussion wherein one is not interested in what is said by others, whether it has some truth or all of the truth, because one simply wants to be heard. Any other view or contribution is of no interest. This is the way for a person in the mode of passion. A vitanda discussion is in the mode of ignorance. In this version the truth is of no value. One simply wants to win at all costs. Krishna Consciousness is not an artificial transformation. Our original consciousness is God consciousness, but now our consciousness is covered with so many identifications, situations and problems. Our consciousness is like water. Water is by nature clear and transparent, but sometimes it becomes muddy. If you filter all the mud out of the water, it again comes to its original clear, transparent state. This is the result of Krishna meditation. Srila Bhaktivedanta Swami Prabhupada said: Neither the scientists nor speculative philosophers have yet arrived at any conclusion concerning the cosmic situation. All they have done is posit different theories about it. Some of them say that the material world is real, others say that it is a dream, and yet others say that it is ever existing. In this way different views are held by mundane scholars. The difference between God and the individual soul is, that the individual spiritual soul is localized to one place and is situated inside the heart. Our consciousness is limited to pervade just this one body. 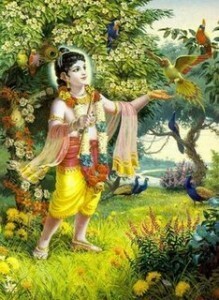 But Krishna has Super Consciousness, He is unlimitedly all knowing. With a small fragment of Himself, He pervades and maintains entire universes. In this way the theory that the soul and God are one, is rejected and not acceptable. A person who imagines that he has become all pervading, thinking himself to be God, is in illusion and deluding himself. When that suffering becomes excessive, it gives rise to a search for happiness. From that desire, discrimination arises, and from discrimination, the tendency for inquiry is born. As a result of this, one attains sat-sanga (the association of saintly people), where upon sraddha develops. When sraddha is born, the jiva ascends to a higher stage, namely the path of bhakti. By Srila Bhakti Siddhanta Saraswati Goswami Prabhupada. "Thoughts are like seeds. Loving and happy thoughts produce beautiful flowers and nourishing fruits; or thoughts can be spiteful and depressed, producing painful thorns and poisonous weeds. We can master our thoughts by directing our Self towards Krishna Meditation, by which the mind becomes our greatest friend. The fruits of this meditation are love of God, divine happiness and contentment." Though we come in various forms and though we are all individual personalities, we all come from the same source and we are of the same spiritual substance as Krishna. “Tattva” means reality, principle, and truth. He is beginning less and we are all also eternal entities, one with Krishna in quality, and different in quantity, we are simultaneously one with and different from Him, we are eternal parts and parcels of God. In the stage of perfection called trance, or samādhi, one’s mind is completely restrained from material mental activities by practice of bhakti yoga. This perfection is characterized by one’s ability to see the Self by the pure mind and to relish and rejoice in the Self. Peacefulness austerity purity tolerance honesty knowledge wisdom and religious ness.These are the natural qualities by which the Brahmans work. The heat and luminosity of the sun’s rays demonstrate to any rational person that the sun, the source of the rays, is not a dark, cold globe but rather a reservoir of almost unlimited heat and light. Similarly, the innumerable instances of personality and personal consciousness within creation are more than adequate to demonstrate the existence, somewhere, of an unlimited reservoir of consciousness and personal behavior which is that of Krishna. This human life is very short. Therefore, like the traveler in a guesthouse, the living entity the spiritual soul, must diligently prepare for spiritual realization during Its stay in this human body and its limited lifespan. Isn’t it foolish to waste time trying to improve arrangements at the guesthouse during one’s short visit, without concern for one’s destination? Who am I?’ This is the first question which arises in the heart of a person seeking the highest good. If one makes a mistake in assessing one’s true identity, then one will make errors when it comes to determining the ultimate goal of life. If one makes an error in determining the ultimate goal of life, then everything done, every effort made, will simply be wasted. The big obstacle to human progress is skeletonism or the faith that ‘I am the material body and reality consists only of what the material body perceives’. In this way one blocks the path to the deeper truth which is perceivable only to the spiritual senses and not to the gross senses. The basic human misconception is that the physical body is the self, which naturally leads to an increasing crisis of the self. The lover, the individual soul, is eternal; the beloved, the Supreme Soul, is eternal; and the loving relationship, bhakti, is also eternal, it is the original function of the soul. Thus, this Bhakti yoga re-establishes consciously, the original loving relationship between the Supreme Soul and the individual soul. It is our unfortunate predicament, that we have forgotten this wonderful truth, because we are falsely thinking ourselves to be products of this material plane. As the sun begins to rise, even before it is visible it dissipates the darkness of night. With the first glimpse of sunlight, fear of thieves, ghosts, and demons immediately disappears, and when the sun is actually visible, everything is manifest and everyone begins performing his religious activities and regulative duties. Similarly, the first hint that offense less chanting of the Lord’s holy name has awakened dissipates the reactions of sinful life immediately. The innermost hankering of every soul is for Beauty, Love, Affection and Harmony; Not for knowledge, power belongings or anything else. Please chant Hare Krishna Hare Krishna Krishna Krishna Hare Hare; Hare Rama Hare Rama Rama Rama Hare Hare. This maha mantra cleanses the dust from the mirror of the mind and awakens us to a pure life of loving devotion to the Lord free from all anxieties. Enter your e-mail address below to receive updates directly to your inbox. Srila Prabhupada. Human life is meant to end all suffering.